The Multiple Roles of Medical Affairs: A Q&A with Joseph Eid, M.D. 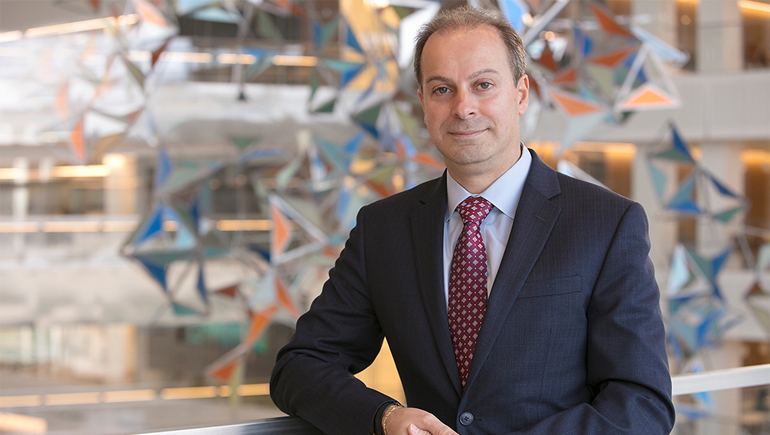 Joseph Eid, M.D., has joined Bristol-Myers Squibb as the Head of Medical Affairs. Joe brings deep leadership skills and proven success in developing high-functioning global medical teams to this critical role. His extensive experience spans clinical research and development for Phase 1 to Phase 4 trials for a variety of products. Prior to joining Bristol-Myers Squibb, Joe was vice president and head of Oncology Global Medical Affairs at Merck. We sat down with Eid to discuss his background and learn more about the vital role played by Medical Affairs organizations in today’s pharmaceutical industry. What attracted you to your new role at Bristol-Myers Squibb? The company’s legacy of innovation was a significant factor. I’ve been in the field of medicine for over 25 years, and in hematology and medical oncology since 1996. During my career Bristol-Myers Squibb has established itself as a premier company in terms of innovative discoveries and cutting-edge clinical and medical research. That innovation has spanned multiple areas – from cardiovascular to hepatology to immunology and, most recently, immuno-oncology. I will also have the opportunity at Bristol-Myers Squibb to apply my knowledge and skills in management and strategyin several therapeutic areas. Early in your career you completed a three-year fellowship at the Robert Wood Johnson Medical School (RWJMS) in New Jersey and then joined the school’s faculty. What was your focus as a faculty member? As a faculty member at RWJMS, I rapidly acquired increasing responsibilities. I had clinical responsibilities in hematology, hematologic malignancies and bone marrow transplantation services. I established the first adult comprehensive sickle cell center in New Jersey. I co-directed the blood bank center at Robert Wood Johnson University Hospital. I also held many administrative roles such as co-directing the fellowship program, directing the hematology course at RWJMS, and chairing hospital and academic committees. In addition, I was involved with institutional- and pharma-sponsored clinical research. What motivated you to move from the academic world to the pharmaceutical industry? In 2004 I decided to leave my full time academic appointment to join the pharma industry. At the time of my departure, I was on call for six months and was juggling many administrative responsibilities that led to a suboptimal work/life balance. Due to the time commitment associated with the clinical and administrative responsibilities, my research activities suffered. These personal and professional circumstances led me to seek an opportunity with Roche oncology R&D where I could fulfill my research interest. Though you took your first role in the pharmaceutical industry in 2004, you haven’t severed your ties to the medical school, have you? I’ve continued to maintain hours in clinical practice at the school as a hematologist-oncologist. My patients wanted me to continue to serve them, and I felt strongly about continuing to provide care. Being in the clinic keeps me close to my field and up-to-date on the practice of medicine. What is it about your work that most motivates you? I’m passionate about bringing innovative treatments to patients and providing them with access as fast as possible. Making that happen requires that all of the functions involved in drug discovery, development and commercialization keep the patient at the center of their discussions and plans at all times. What is the role of Medical Affairs in today’s pharmaceutical industry? Medical Affairs plays two key roles. On the external side, the medical organization serves as the bridge between a company and numerous external stakeholders. These stakeholders include medical communities, medical societies, payers, regulatory authorities and patient advocacy groups, to name a few. Medical communicates the safe and appropriate utilization of products to stakeholders and it also gathers insights from stakeholders relative to medical practices and patient needs. Internally, Medical Affairs is the bridge between the research and development organization and the commercial organization. Here at Bristol-Myers Squibb, Medical has a global footprint, and our highly trained and educated personnel channel hundreds – if not thousands – of actionable insights from the medical community that could inform the strategy of our R&D and commercial groups. What does the future hold for Medical Affairs? Medical Affairs is one of the most important organizations within the pharmaceutical industry these days, and the future for the function is bright. People in Medical Affairs are special, and the job requires both scientific knowledge and business acumen, and we always need to bring new ideas to the table to help our internal stakeholders and, most importantly, the patients that we serve.